HILLSBOROUGH: Libby Walters, 54, lost her battle with cancer and passed away Friday, November 23rd, 2018 at her home in Hillsborough. She was born in Durham, North Carolina, the daughter of the late John Boyd Walters and Doris Henrieta Lyon Walters. Ms. Walters was a strong and courageous woman whose personality made everyone smile. She is loved, missed and will always be cherished. 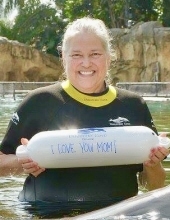 She deeply enjoyed camping and swimming and recently was able to fulfill her top bucket list wish, which was swimming with dolphins. ​Ms. Walters is survived by her daughter, Kayla Denise Gatewood and husband Jason Gatewood; sister Cathy Allen, partner Mark Smith, and step-daughter Krystal Starr Smith. ​The family will receive friends prior to the service from 1 to 2 p.m. at Clements Funeral Home in Hillsborough and other times at the home. A funeral service will be held at 2pm on Tuesday, November 27 at Clements Funeral Chapel. ​The family is being assisted by Clements Funeral and Cremation Services, Inc. in Hillsborough. Online condolences may be sent to www.clementsfuneralservice.com. To send flowers or a remembrance gift to the family of Libby Walters, please visit our Tribute Store. "Email Address" would like to share the life celebration of Libby Walters. Click on the "link" to go to share a favorite memory or leave a condolence message for the family.